The Surgical Skills Centre delivers high quality, relevant procedure-based skills courses to local, national and international medical personnel at all stages of their career. View our calendar for upcoming course dates, fees and availability of places. Follow DIHS on Twitter and LinkedIn for the latest news and activites planned. Information on accommodation and travel to Dundee. excellent model for procedural skills training that is unique in the UK. This refurbishment provides us with an additional seminar room, a new delegates lounge area along with a new AV/IT installation. The Royal College of Surgeons of Edinburgh (RCSEd). Robotic Training as we recieved our Da Vinci Robot to the Surgical Skills Centre. Dundee Institute for Healthcare Simulation (DIHS) has taken delivery of a leading-edge surgical robot. 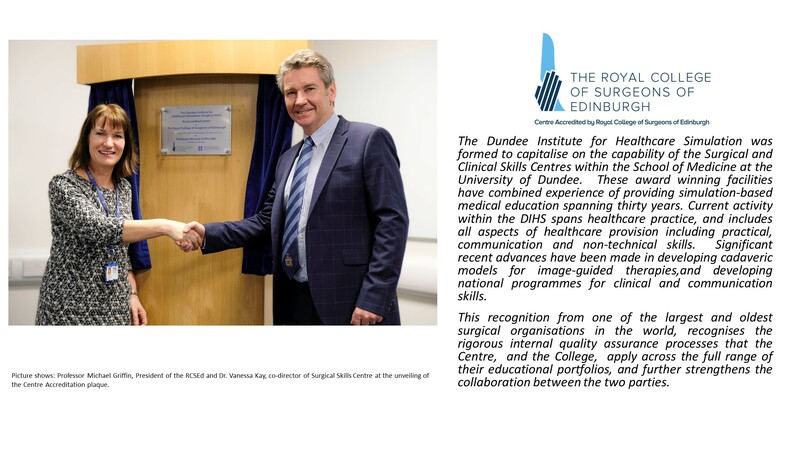 DIHS, a medical education centre formed by the University of Dundee, NHS Tayside and industry partners Medtronic, are developing the first training programme for robotic-assisted surgery in Scotland. Surgical robots are used to carry out operations across four health boards in Scotland, but surgeons must travel to England or overseas to be trained in their use. The installation of the £1.7 million da Vinci robot at DIHS is the first step towards a full robotic training centre being established north of the border. The robot will be used to train surgeons and theatre staff across disciplines including urology, gynaecology, ENT and general surgery. A range of courses from basic robotic skills to advanced masterclasses will be available at DIHS while training will also be given to surgeons alongside the conventional components of existing medical courses. 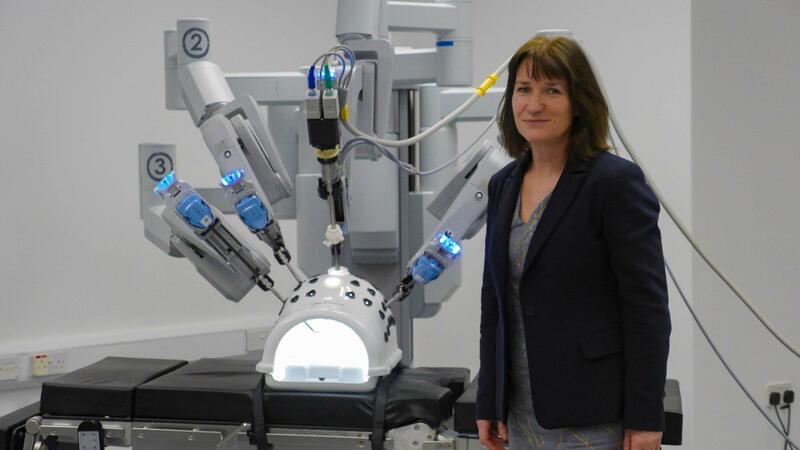 DIHS Co-Director Dr Vanessa Kay predicts that robotics will eventually transform the surgical process in the way that the minimal access, or keyhole, surgery pioneered in Dundee by Sir Alfred Cushieri did. “No one was doing laparoscopic surgery when Sir Alfred pioneered its use and clinical implementation but now 70% of all surgery is minimally invasive,” she said. “Soon we will start to see robotic surgery taking on more and more of the procedures currently done as a result of Sir Alfred’s work. “There are so many advantages to robotic surgery for both patients and surgeons. Evidence has shown that robotics can lead to better outcomes, reduced length of hospital stays, reduced amounts of blood lost during surgery and improved accuracy of technique. As such, it is vital that Scotland is at the forefront of robotics training and implementation. The da Vinci robot to be installed at Ninewells has been made available to DIHS as a result of its academic and commercial partnerships with organisations including Mid Essex Trust Hospital Services Trust and Intuitive Surgical, manufacturers of the robot. DIHS was officially launched at the University’s School of Medicine at Ninewells last year. Refurbished at a cost of £250,000, DIHS doubled training capacity and brought together the University’s Clinical Skills and Surgical Skills centres to form the first single-site facility in Scotland offering both surgical and clinical training. Doctors from around the world are among those who will take advantage of the ground-breaking training opportunities on offer at DIHS.